Happy Cinco De Mayo Amigos! This holiday is one of my favorites and definitely one that we never miss. We always celebrate with tacos and tequila of course and man do we whip up some darn good margarita's. 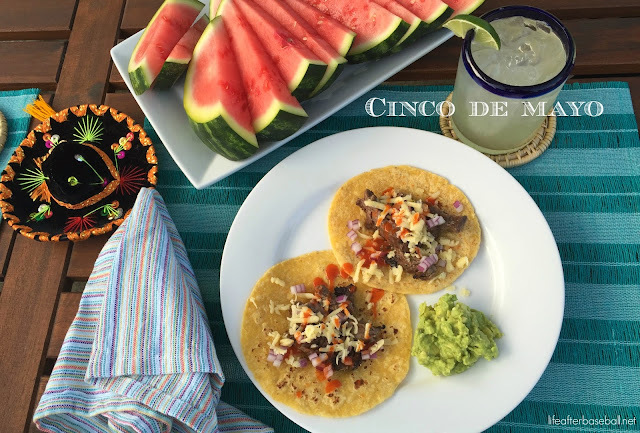 Yesterday morning, I decided that we should start our fiesta early and grill out our favorite skirt steak tacos because the weather was absolutely gorgeous and our evening schedule was free. Plus it's always a bonus when a good friend of yours from out of town stops in unexpectedly. It turned out to be a wonderful night and like I said earlier...the margarita's were on point. We made a quick version of our unusual ones but I found this really, simple margarita recipe on Food & Wine's site yesterday. I think you knew exactly what I needed Charity lol. I wish I had this on my plate right now. I need some guac. Happy Cinco de Mayo! This sounds like fun. We will be doing guac, queso and homemade crunchwraps. I will be rolling down the street tomorrow! Dinner looks delicious. Love your presentation! Yum! I had a great Cinco de Mayo, anything with tacos and guacamole is a day I'll partake in! Looks really tasty))) Great menu for celebration!